While Rama is known for qualities like righteousness, determination and vision, his stark opponent Ravana is known for his wisdom, administrative skills and ambitiousness. 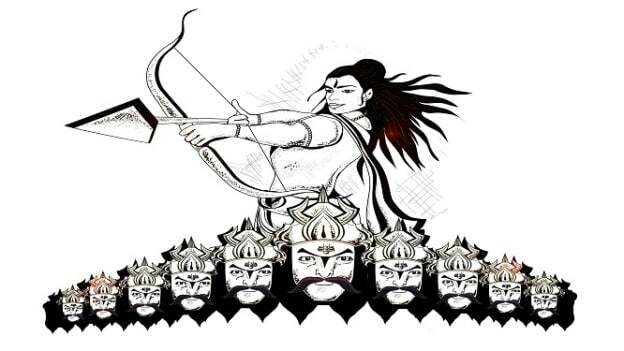 While there are extreme differences between the two personas, every workplace needs to have a combination of Rama and Ravana to have a strong and successful team. As we celebrate the victory of good over evil during Dussehra, here is a look at some unique qualities that Rama and Ravana possessed that each one of us at work would have too. These qualities not only add to having a good mix of people at the workplace but are necessary to run a successful team and organization. Read on to find out some of these peculiar traits. Full of love, admiration, and respect, the Rama at your workplace embodies the characteristics of a visionary. This employee loves to plan and is often able to envision the future ahead and layout an effective blueprint for the rest to follow or lead. The Rama at your workplace has a strong work ethic and puts duties and responsibilities above everything else. While this employee is focused and loves to follow a path, he/she is flexible and welcomes new ideas and people in the team. Highly imaginative and innovative, the employee that carries the qualities of Rama can grow to become an exemplary leader. HR and managers must invest in this employee and identify these competencies to further nurture and enhance them. Teams need a visionary employee like Rama, to help them prepare for the future and to guide them and prepare them for what’s ahead. Albeit painted in a rather negative hue, Ravana was an intelligent administrator and there are lessons to learn from his endeavors. As an administrator, one not only needs foresight in order to lead but also a sharp intellect to be able to make the most of hindsight and thus learn from past mistakes. Another prerequisite is an impeccable insight into people without which it would be impossible to amass collective effort towards a shared goal. Thus, we learn the importance of planning, people skills, and perspective from the Ramayana's chief antagonist. In Hindu arts and texts, Rama is portrayed as a compassionate person who cares for all living beings. Remember the incident of Jatayu, who when trying to recuse Sita from Ravana, gets valiantly hurt. Rama is as much overwhelmed by grief as by a surging sense of affection and gratitude and blesses the bird to receive final salvation or Moksha. Or remember the instance of the squirrel, who he sees going up and down the seashore with little pebbles in his mouth, doing its little part in helping build the bridge over the sea to reach Lanka. When the squirrel is rebuked by a monkey for coming in his way, Rama points out that it’s the pebbles and the sand carried by the squirrel that are binding the huge stones together. Through these incidents, Rama essays the characteristics of a nurturer at the workplace-someone who realizes and more importantly appreciates the potential of each and every one on his team. Be it a high performer like Jatayu or a tiny contributor like the squirrel, a nurturer brings out the best in all, realizing that however small, every task is equally important. A project can never be completed by the star performers alone. It needs the support of all, and however small, every performer should always be appreciated! Ravana’s ambition is usually perceived as negative. However, in today’s evolving workspace, possessing an ambitious streak is essential. An ambitious employee has a drive and enthusiasm about her/him that motivates them to go beyond what is expected of them. The Ravana at your workplace is not bound by the confines of a job description. She/he is the one who will find solutions to roadblocks and ensures that the goals are achieved. Such a spirit brings a force of determination to the entire team. Modern day entrepreneurs and ambitious Ravanas take on seemingly impossible tasks and turn them into realities through sheer determination and commitment to their goals. Lord Ram was highly recognized for his righteousness. His life was based entirely on Dharma, which means the idea of a law, or principle, governing the universe. Rеgаrdlеѕѕ of the many hardships like obeying his father’s orders for 14 years of exile, by no means did he ever deviate from the right path. He was dutiful and followed the code of values and ethics. Righteousness at work can be interpreted as being pragmatic, being calm during crisis and not responding emotionally but logically. It is about being fair and just at work and with one’s co-workers. Ravana was the most learned scholar to have ever lived. Ram asked Lakshman to sit beside Ravana when he was dying and acquire knowledge in statesmanship and diplomacy. We find people in the workplace who are knowledgeable. And it is important to not only preserve staff for organizations but also to help them stay updated as well. Organizations typically have knowledge sharing activities through which insights, skills, and expertise are exchanged between people and organization. When information and expertise are properly shared, employees not only become aware about what is expected out of them, but it also helps them gain insights from colleagues to deliver results. One of the qualities that helped him get back Sita and survive fourteen years in the Jungle was ‘determination.’ In the current scenario, organizations need employees who are dedicated to their work. Determined employees will never fail to achieve their targets. The determination at work leads to impeccable results because the employee is worried about reaching the goal. The workplaces always need such employees to make the company successful. Nothing can stop a person who is determined to achieve success. The image of Ravana immediately conjures up a distinct feature about him. Multiple heads and multiple arms. It symbolizes a prized trait – multitasking. Among the many roles that Ravana is described to have, he is thought of a maestro of the Veena, a great scholar, a capable ruler, a son and a brother among others. Ravana reminds us of leaders at the top, who often take on multiple decision across the business. A case in point would be leaders like Jeff Bezos and Elon Musk who are often praised for operating in multiple distinct businesses. Ravana reminds us of the endless possibilities that we can navigate in our lives. So, if you have already identified the Rama and Ravana of your team, tag them and do comment on the story below!